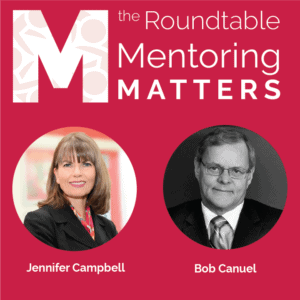 When it comes to advancing our careers, we hear a lot about mentorship and sponsorship. And, the question often emerges as to how they differ and how to find the right people. Helps you look at things differently. While there are some organizations that have formal sponsorship programs, more often sponsorship tends to be less formal in nature. “A champion that is more senior to you in your organization who helps you with your career trajectory, fighting for you to move up the ladder within your organization” is how Jennifer describes a sponsor. This may or may not be a boss. Many sponsors are not direct bosses. What is seen as important is that they are senior in the organization, with clout and respect, and that they understand what you are made of, and what you are capable of. Jennifer also suggests that we take the emphasis away from finding a single sponsor; and put the emphasis on making sure that you have what she refers to as ‘friends at the grown up table”. In other words, when the time comes for senior leaders to gather and discuss talent, you want to know that you have people around that table who know what you have accomplished, what your team has accomplished, the potential impact of your current priorities and what you’re capable of doing in the future. Ultimately, the more senior people you have in your corner, the better. And, with today’s rate of change, you don’t want to put all of your eggs in one basket! Be clear on your career objectives and goals and be sure those are stated and known to your boss. Know what you want to be known for and how you want to be perceived. Consider what you have to offer that may be of interest to others, and remember that sometimes you need to give to get. Show up every day with authenticity and openness, and give your best. If your boss is not someone who you view as a potential sponsor, expand your network as broadly as you are able in the organization. Consider which people at the ‘grown up table’ could be your champions. Remember this is not only about title, but also about respect and influence. The former doesn’t guarantee the latter. Engage your boss to help you gain exposure to your potential champions so that they can see what you’re doing and the value you bring. Consider what you yourself can do to get visibility across the organization with other senior leaders. Stick your head up from your day-to-day work and look for opportunities to interact with other groups – participate in cross-functional project teams, help out with the holiday potluck or a fundraising event. Speak up more often and get comfortable bragging. Be the person that others always know is willing to help and can be counted on.